MONDI™ fittings are cast in special patterns with heavy wall thickness for large corrosion allowance needed in the acid industry. These patterns have thicker wall than 250 psi ductile iron patterns. See wall thickness by size for our pipe and fittings. For example – a 14″ 90° MONDI™ elbow has a wall thickness of 0.82″ and weight of 330 pounds versus a wall thickness of 0.66″ for 250 psi ductile iron and weight of 290 pounds used in the water industry. Center to face dimensions meet ANSI/AWWA C110/A21.10 standards. The inside diameter of the fittings matches the inside diameter of the pipe. Flanges have ANSI 125 psi bolt drilling or other bolt drilling if required. Bossed fittings and other special fittings are available. Patterns for fittings are designed to virtually eliminate all chaplets. When a chaplet must be used, it is made of MONDI™ with a special finned design which fuses in to the fitting. APT fittings have both MONDI™ metallurgy and heavy wall thickness for superior performance. Flange faces have the special phonographic finish which bites into the gasket for a proper seal. 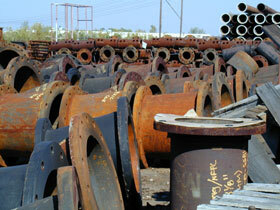 Flanges faces are protected with rust preventive and flange covers if required.